EasyStandard floors are probably the most popular of all the floor constructions that we supply underfloor heating systems for. They are essentially systems where pipes carry warm water through the floor while encased within concrete or screed. The EasyStandard system is designed for use on projects where a solid floor is to be installed. 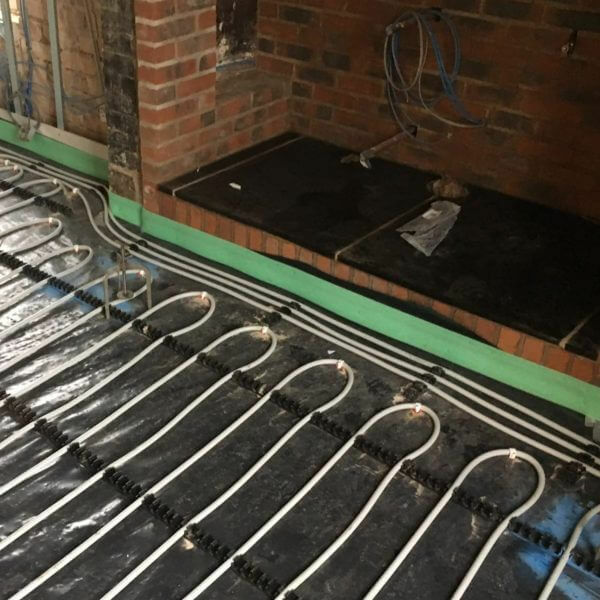 These systems traditionally tend to be used with a normal screed or concrete, however modern liquid screeds available can make the installation quicker and even improve the thermal output of the system. One of the major benefits of the EasyStandard system is its compatibility with low temperature heat sources, such as ground or air source heat pumps. The pipe spacing can be reduced or increased depending on the heat loss of the building and the water temperature being supplied by the heat source. Basements and ground floors are the typical scenarios that these systems get used in. However when Underfloor heating systems are to be used with heat pumps on intermediate floors then EasyStandard systems must be considered to maintain the low water temperatures and the efficiency of the heat pump. These types of installation usually consist of a block and beam construction although other methods are also available. 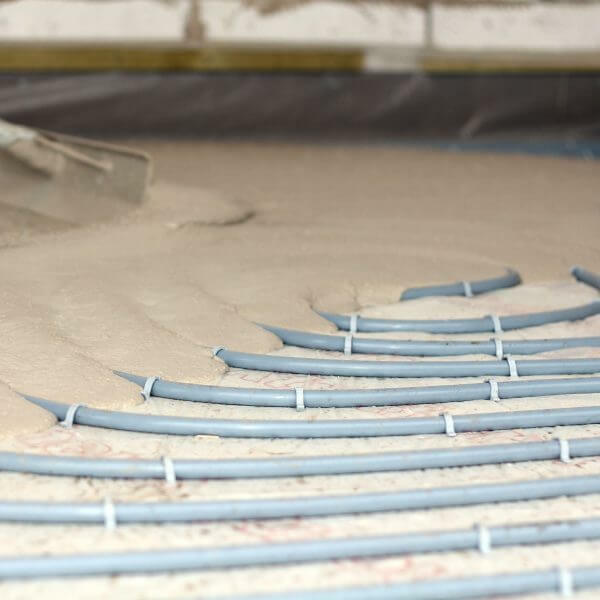 There are many different screeds available, including anhydrite liquid screeds as well as traditional pumped and mixed screeds. 4:1 sand and cement screeds should be between 65mm and 75mm thick. Modern liquid screeds can be laid much thinner than traditional screeds, usually allowing a minimum of 55mm. Insulation must be used directly beneath the screed to prevent the heat from being lost downwards. The thickness can vary though depending on building regulations and type of insulation used. However a good rule of thumb is to allow 50mm for a PIR (polyisocyanurate) insulation board. If installed in a basement or ground floor, the floor build up would normally stop after the damp proof membrane had been installed. 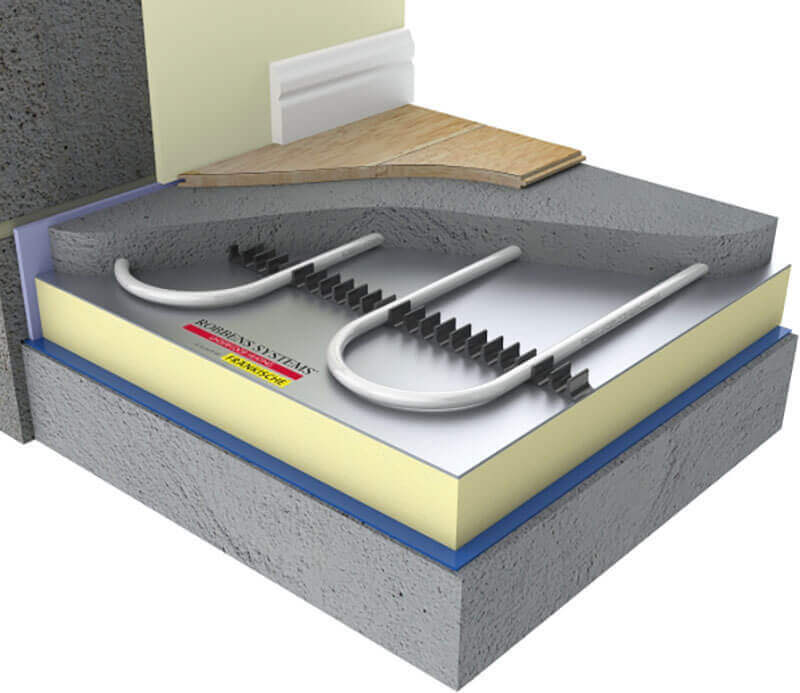 At this point the insulation for the underfloor heating would be laid and the vapour barrier would then be installed on top of the insulation and then the pipes would be clipped to it using a barbed clip pushed into the insulation from a clip gun. Once the pipe work and manifold has been installed and pressure tested, the screed would then be laid.  If using liquid screeds, then particular attention should be paid to ensure that the screed does not run between the boards and through gaps in the vapour barrier.